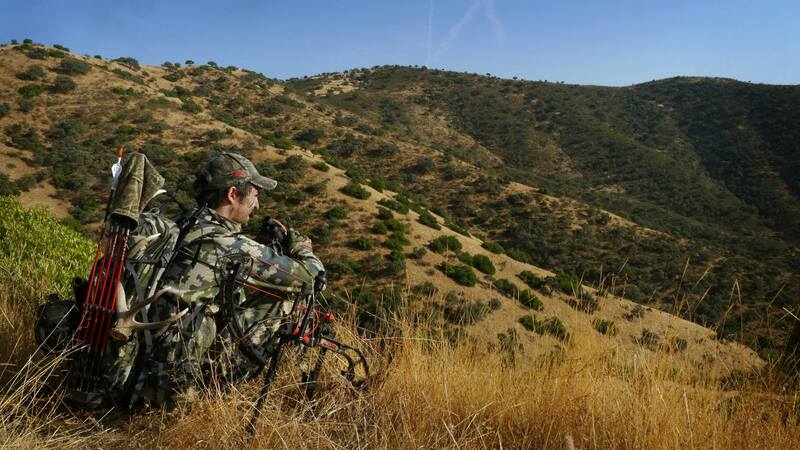 Gear has been one of the major advances in the hunting industry on the last few years. As hunters we get to hunt some tough places in some nasty conditions, and through the adaptation of mountaineering clothing to hunting, we now can hunt longer and more comfortable than ever before. There are a lot of companies theses days offering this kind of gear, but probably the one that keeps pushing the limits higher is KUIU Ultralight Hunting. Based on a layering system, it allow us to adapt to the different conditions as the days moves forward. It not only can be cold in the morning and warm during midday, but also rainy or windy in between, and our needs will not be the same if we are climbing or if we are sitting down glassing. 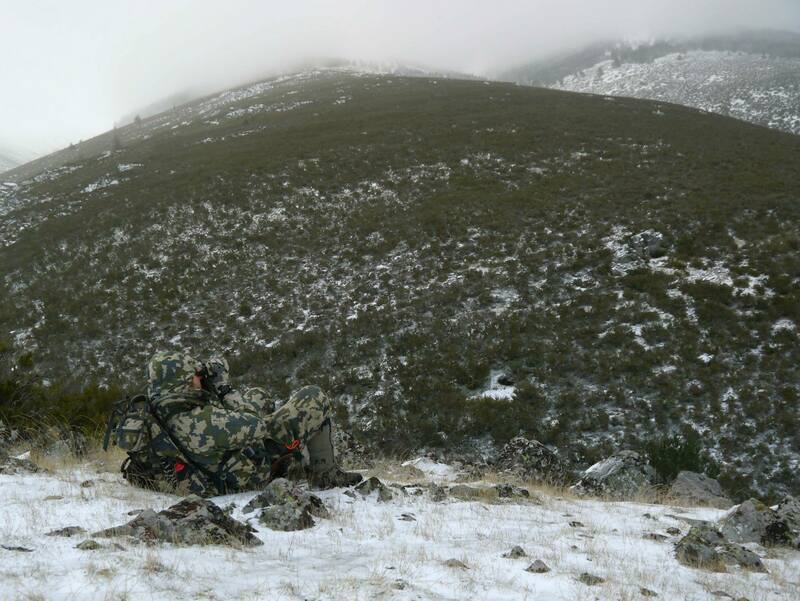 There is not a 5 in 1 jacket that can make us feel comfortable in all these situations, and the most efficient approach is the combination of different layers, each having its own purpose, for which I trust the KUIU system. Base layer based on the finest merino wools, with a new fabrication process of the fabric (Nuyarn) which makes them more comfortable, stronger and more efficient. Merino wool properties have become pretty popular, and has proved to be a perfect first layer material in a wide range of scenarios, regulating your body heat on warm and cold weather, and also keeping you dry . Even its anti-bacterial resistant, which helps regulating your odor. Insulation is based on Down, which creates an air layer that keeps your own heat. One of the things I like is that you do not over heat, since it keeps you body temperature, keeping you warm in a wider range of temperatures, even if you are not producing heat. Its weight and volume are amazing, forgetting that you have it on your pack. 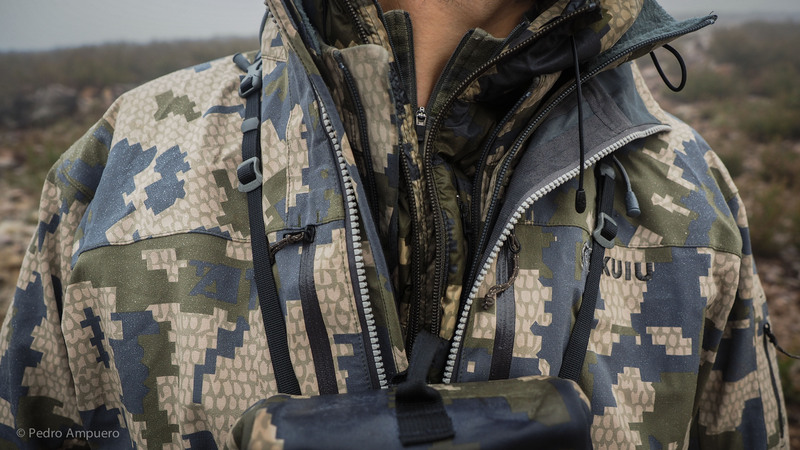 One of the unique feature of KUIU´s Super Down, is that apart from the quality of the down used, each feather has a waterproof treatment, which improves they performance on humid weather, decreasing their capacity of absorbing humidity, which tend to compact the feathers together reducing the insulation. Its the perfect piece for use in cold weather, and really like it also for glassing or camping around. After a hike, when you sit down to glass for a while, that sweat always makes you get cold. I bring the super down in an easy access pocket to take it out in a second and glass comfortably. The outerwear could be divided in two areas, the soft shell layers and the rain gear. The soft shell made of Toray Primeflex fabrics are light, stretchable, and breathable. There is nothing like hiking with pants that do nots restrict your movements and that does not have uncomfortable seams. Love that they have ventilation zips for those aggressive hikes, letting air get in to cool you down. Apart for their water resistant capacity finishes they have, they are highly breathable. Rain gears are also stretchable, something that really changes your experience, used to those annoying rain gears that limited so much your movements. Finally mention the main gear accessories. One of the ones I use the most are the KUIU gaiters. They are tough, waterproof and breathable. Perfect combination to for trough nasty wet terrain, cross river and don’t end up with wet sweaty legs. They are even easy to put on! Also a layering system for the hands, with merino, soft shell, insulation and waterproof type gloves to cover every situation. Soft shell and merino bennie for the head, to end up being covered and protected completly. A quick summary of the exact pieces I currently use classified in season. Spring.For spring hunts I use the Attack pant mainly, and if it is very humid or warm the Tiburon pant. An Ultra Merino 145 Zip T, combined with the guide vest for the early mornings hunting roe deer. I use also the guide jacket when temperatures are colder or if I am on a mountain hunt after chamois where wind can come out. Chugach jacket and pant always on the pack in case of some showers, it is a very light and compact rain gear. The same with a super down jacket just in case temperature drops. Gaiters also on if there is a lot of dew or if rivers need to be cross. Summer. For summer or warm weather hunts I use the Tiburon pants and Tiburon Zip-T or the Ultra Merino 145 Zip T. Guide Vest also in for the early morning and the Super Down if I am camping out for the night. Fall. Fall hunts can bring you anything, so better be prepared. I typically use the Attack pant, but bring a merino base layer for the legs just in case temperatures get colder. Ultra merino 145 and 250 Zip T, which I combine depending on the temperatures. Guide jacket and vest. Also the Super down hooded jacket. In the fall I use the Yukon rain gear, its a bit heavier, tougher, more stretchable and less noisy. It is more meant to hunt with it for long periods, rather than for going through a shower. Its the ultimate protection layer, and in combination with the other layer you could survive anything that the weather throughs at you. Gaiters become a must as the season moves forward. Winter. For the winter hunts I use the Guide Pants, which are thicker in combination with a merino layer. If I am going to hunt on a treestand or something very static, I use also the super down pants. Upper body systems its mainly the same as the one use in the fall, adding sometimes a mid layer of fleece. Gaiters and the complete glove system becomes a must too. There are a lot of things to speak about gear, these are just some, I invite you all to learn more about them in their blog. One of the most amazing things in their philosophy of supplying the best quality gear is their direct consumer selling approach, where they are able to cut shop margins completely to keep bringing the best at reasonable prices.